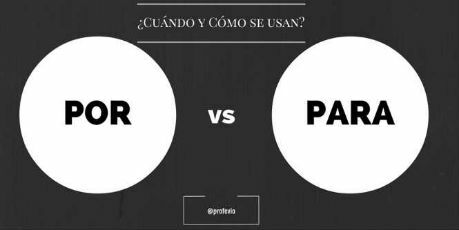 Proper use of the prepositions por and para can be difficult for non-native Spanish speakers because of their variety of meanings. Both of them usually mean "for". Let's focus on their uses to truly grasp por vs para. Sonia goes to the grocery store in order (for) to buy the bread. You can have one hour for (per) day maximum. How much do you all charge for (per) night? The fee for sending the money is $20. For me (in my opinion), the color of the car is very important. 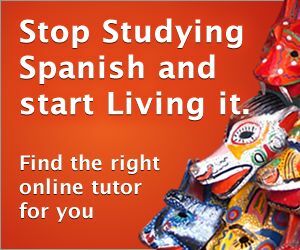 By the time you finish this lesson, por vs para will no longer be a dilemma for you! Yo no sé si María tiene el dinero para comprar los boletos. I don't know if Mary has the money to buy the tickets. María va a comprar un regalo para ellos. María is going to buy a present for them. I'm here for business issues. Estoy aquí por dos semanas. I'm here for two weeks. Estos zapatos son para Miguel. These shoes are for Miguel. Tendrás que terminar para el lunes. Para alguien tan inteligente, lo que hizo es mediocre. For (considering that) somebody as smart as he is, what he did was mediocre. Cancelaron el partido por la lluvia. They cancelled the game because of the rain. Austin es conocido por su música. Austin is known for its music. The burglars came in through the window. Vamos por la calle sexta. We're going by way of Sixth Street. Estoy contigo cien por ciento. I'm with you one hundred percent. Íbamos a 80 millas por hora. We were going 80 miles per hour. Gano diez dólares por hora. I make ten dollars per hour. Te doy mi reloj por tu bici. I'll give you my watch for your bike. Lo compré por quince dólares. I bought it for fifteen dollars. Fuimos a Veracruz por autobús. We went to Veracruz by bus. Esa canción fue escrita por Tracy Chapman. That song was written by Tracy Chapman. the object of an errand with verbs like: ir, enviar, mandar, venir, etc. Mi tía vino por el pastel. My aunt came for the cake. La señora mandó al niño por el canasto. The lady sent the kid to get the basket. with "estar" to express "to be about to"
Mi papá está por explotar. My dad is about to explode.